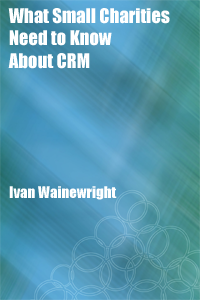 I have just published a new, free ebook: What Small Charities Need to Know about CRM Systems. Buying a new CRM system or fundraising database can be a daunting experience for any NFP organisation, let alone a small charity. And although I publish a lot of information on this blog which I hope is useful for all charities, there are some points which I think smaller organisations need to particularly be aware of or specifically consider. So I have brought these issues together into a new, free ebook. Which in some ways was quite difficult! Because when I read back over my blog posts, so many more of them are equally appropriate for small charities too! I have therefore limited myself to just twelve areas which I believe should give a small charity a solid understanding of what they need to know about CRM systems and fundraising databases. But if you want to know more, then there's lots more on all my other blog posts. The book has been produced for people whose day job is not the procurement or implementation of new databases - which for small charities is probably almost everyone! And you do not have to be technical to understand it. It is for fundraising managers, chief executives, trustees, fundraisers, office managers, volunteers and those working in supporter services, but of course I hope it is equally useful for database staff and charity IT staff too. If there are any points you think I should have included in this book then feel free to add them in the comments below. You can download the book from my website: http://www.itforcharities.co.uk/free-ebooks/. Thanks for this link and the articles on Raiser's Edge. I'm working at a (mainly) state-funded University in NZ looking to extend additional fundraising activities into a full CRM system. There are two camps internally. First, the camp that says that Raiser's Edge NXT will be huge and can do the job of a CRM (indeed Blackbaud are marketing it as such) The second view is that we need a proper CRM to do a proper job of managing the changing relationships with people from local resident noise control through to maintenance contracts, alumni contact... and ultimately it will be able to manage fundraising. What are your thoughts? First off, let me prelude this by saying that my answer here is very generic and any situation does of course come down to so many factors, from functionality to skill-sets, existing systems, budget, people, requirements now and in the future, priorities, record volumes etc etc. NXT is first and foremost a fundraising/alumni and "relationship management" system. It is not promoted (to my knowledge) as a "CRM" system a la Salesforce, Dynamics, SugarCRM etc. [Blackbaud CRM is somewhat more akin to that, but still primarily NFP/Higher-Ed oriented]. So if your primary requirement was a fundraising system with some ability to record some information about some other types of contacts, then NXT might be worth looking at. I.e. You could record, say, the names and addresses of local residents, maintenance suppliers etc in NXT (as you could in any similar database) but as soon as you want to record and manage more specialist information on, say, noise control complaints, maintenance contracts/SLAs etc then that's not what it is intended for. Whereas, of course, you can use the CRM systems such as those mentioned above for such functionality. You could therefore use/buy a CRM system and develop the fundraising functionality you require on that, but be aware that can of course take a lot of work depending on exactly what you want. If you are more about major gifts and corporate fundraising then that's more viable as a starter but as soon as you get into regular giving, tax efficient giving (depending how that works in NZ? ), pledge management, event management, income processing and so on and so on, then it will take longer and longer. Or (and forgive me if this is obvious) you could buy NXT for your fundraising needs and integrate it with a separate CRM system - but, again, takes time, effort, skill-sets etc and depends on your benefits, costs, priorities etc. There are also some third-party suppliers who are starting to create Fundraising/NFP "templates" for some of the leading CRM systems and they might also be worth looking at.